Kevin was recently commissioned to make a keepsake box out of Brazilian Rosewood and Brazilian Rosewood Burl. He was provided with a very small sampling of each wood from a decades old inventory. When I first saw this material I thought he was getting in way over his head. Although the Brazilian Rosewood looked normal enough, the burl was exceptionally thick since it came from resawn stock. I was concerned that the thickness variations would result in unanticipated twisting or warping. But Kevin was undaunted, and the net result of his efforts are shown here. Quite frankly, he did an outstanding job under very trying circumstances. 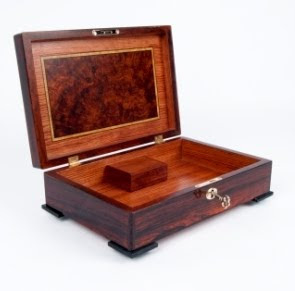 The exterior of the box is crafted from quartered Brazilian Rosewood with an inset of Brazilian Rosewood Burl. 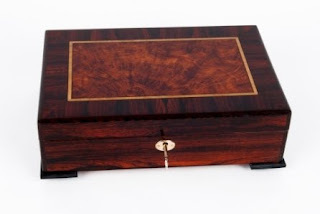 The inlay banding is Ebony and Satinwood, with solid Wenge corner beading. As an added detail Kevin also inset the Burl into the underside of the lid, this time in a field of quartered Bubinga. 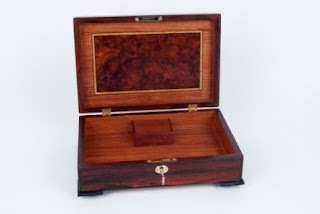 The tiny enclosure at the back of the box hides the music mechanism. Overall dimensions are 12-1/4" wide x 8-1/8" deep x 4-1/8" high.